The interior of this beautiful jewelry box has ample space for earrings, cufflinks, necklaces, bracelets and watches. 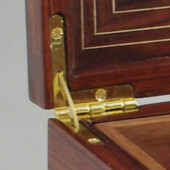 The one tray has seven ring inserts, each of which can accommodate two rings and/or earrings, or a pair of cufflinks. The flowing Santos Rosewood scene in the centre of the top is quietly bordered with Santos Rosewood bands which are accentuated with maple veneer edges. The box "floats" on a recessed base of 1/4" high Black Walnut. 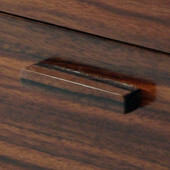 Santos Rosewood wood drawer pulls. Interior is lined with a luxurious dark red faux-suede. Ring inserts are covered in the same luxurious material. The drawer is about 1 1/8" (2.9 cm) deep. Interior dimensions are about 9 1/2" x 6 3/4" (24.1 x 17.1 cm).